You climb the stairs, walk across the top and fall into the labrynth. A three dimensional labrynth far beyond anything Daedalus could do. Ever changing colors. Surely a challenge for even the best of labrynth runners. If voice fails on Windows, here is the first thing to try. 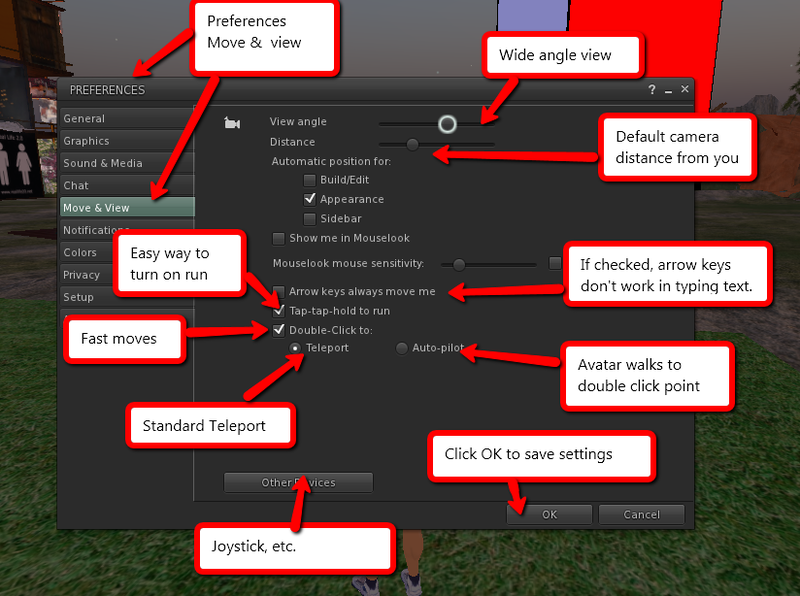 In SL window: Me-Preferences-Sound and Media-turn voice off, then turn it back on. This procedure fixes a frequent problem in which SL Voice.exe continues to run after you exit SL. If voice does not recover in a minute or so, I recommend that you log off and reboot the machine. The instructions here apply to viewer 3.3+ . The details may differ on other viewers. 2013 HELP: Scripts color for you. These things are in the Content Creator Kit. They are full perm with coloring scripts in them. You can take them apart and see how they work. You can change the color settings and see the effect. When you get more familiar with scripting, you can modify other parts of the scripts. The Kits are identified by floating text when you get close to them. Click on a box and it will offer to deliver its contents to you. The numbers you use to specify colors in a script are superficially different from the numbers you use in setting colors in the Texture Window. This sets all colors to full intensity, producing white. Notice that the numbers have a decimal point. You know it is not needed, but the compiler expects it. It is not wise to confuse your compiler. Note also that the numbers are separated by commas. You will want to remember these things when you get an error message. Divide texture window numbers by 255. 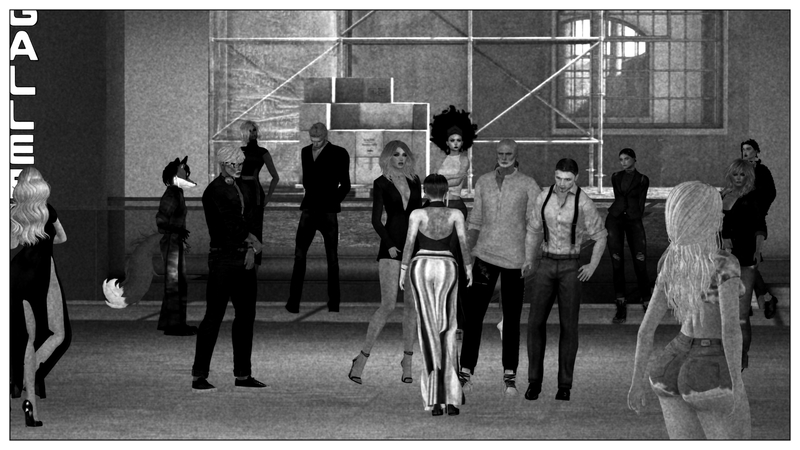 2013 PROMO: Schedules: Second Life already has a calendar. Why would we need another? 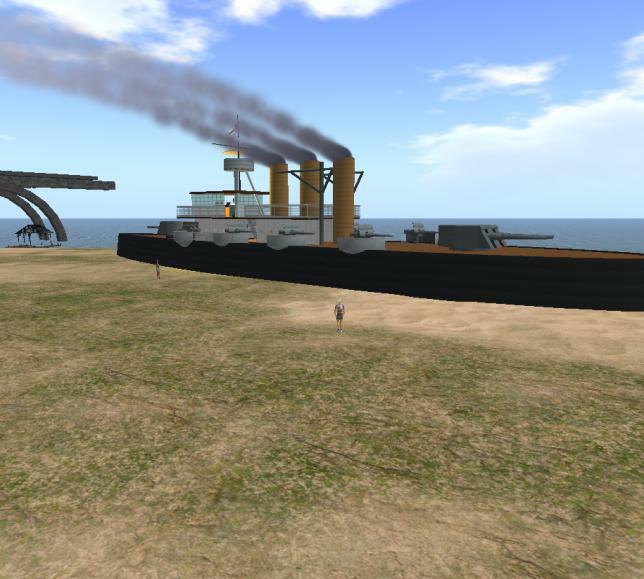 Second Life already has a calendar. Why would we need another? I checked out the calendar in its current form. For this post, I tested it as a beginner might. Here is what I found. 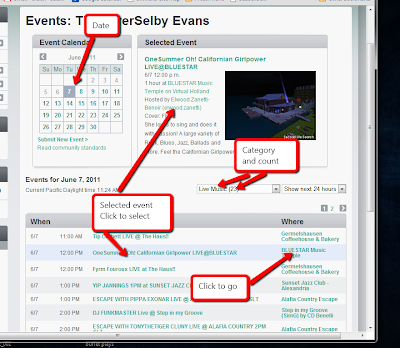 The above display shows what beginners would see if they signed in and clicked on an event. For people who are not signed in, the selected event panel shows blank. You can "Search by event date, time or category." Well, actually, you can search by date-time (these go together) AND category. In other words. you can pick a specific date and time, then search by category. So I can find events going on right now or this evening or tomorrow evening. I can narrow the search to a specific category, such as live music. So far, so good. But the categories only work for me if I am looking for a category, such as Live Music, that is on the list. If I want a particular genre, I am there without a paddle. I can, of course, look over the live music offerings for any day and decide whether I see anything interesting. 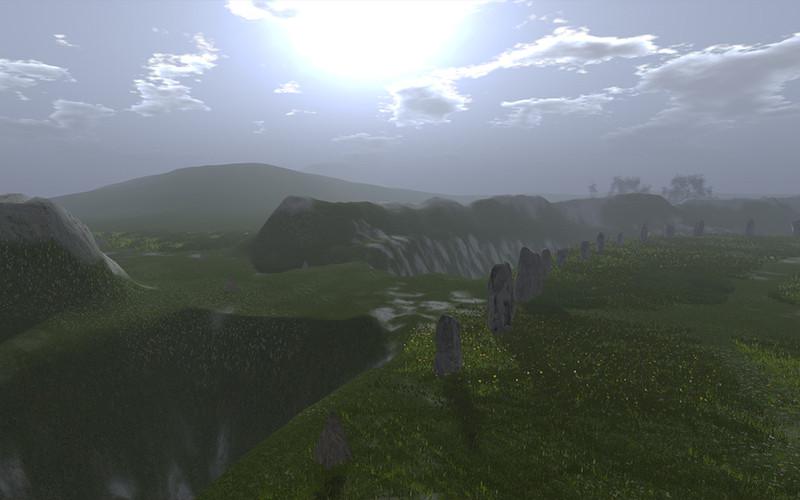 But I can't find out whether Second Life ever has any kind of classical music on offer. At least, not from this calendar. The numbers is parentheses indicate the number of such events in the time period under consideration. That period was Saturday morning, May 6-to May 7 (24 hours). Yeah-- those numbers do look small to me. 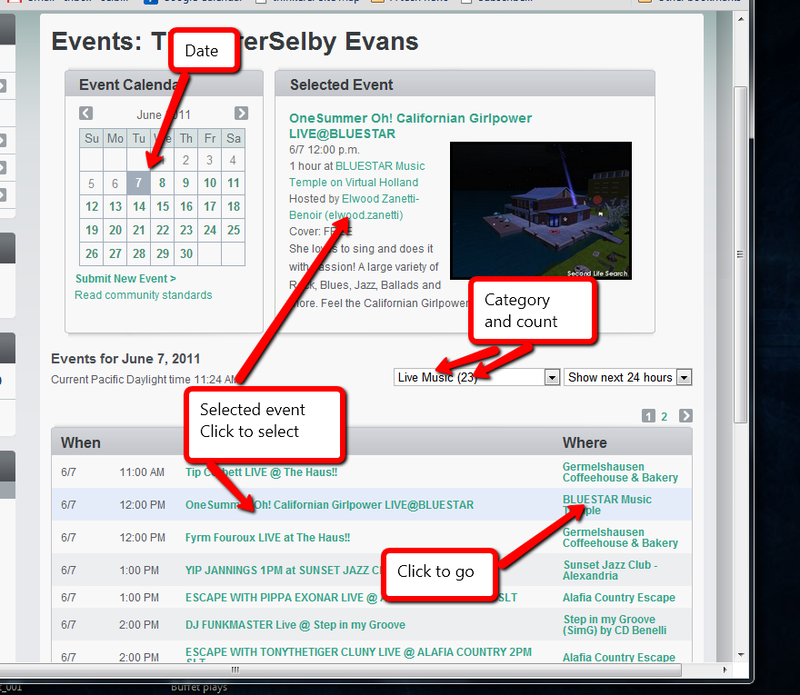 The numbers lead me to wonder whether some some event managers are not bothering with the Second Life Calendar. I can well understand that view, particularly if you are doing something like comedy, which has no place in the Second Life calendar. 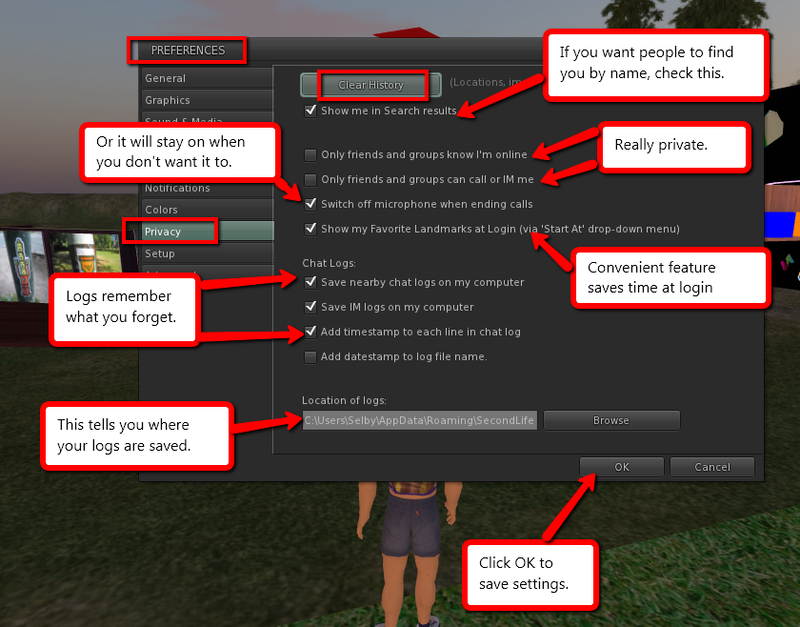 I don't think this set of categories has changed since I last used the Second Life calendar to look for entertainment. That was back in '05. Linden Lab was trying hard to show they could run 4,000 concurrent users. They actually did run that many users. But probably not without breaking a sweat. Back then, I looked at the calendar a few times, quit, and never looked back. The categories were never going to give me the details I needed to find something interesting. My guess was then, and is now, that those categories were put there as place holders for the time when a serious set of categories was available. Apparently, that is not yet. In these more modern times, of course, we would not think of categories at all. (Search by category is so last century.) 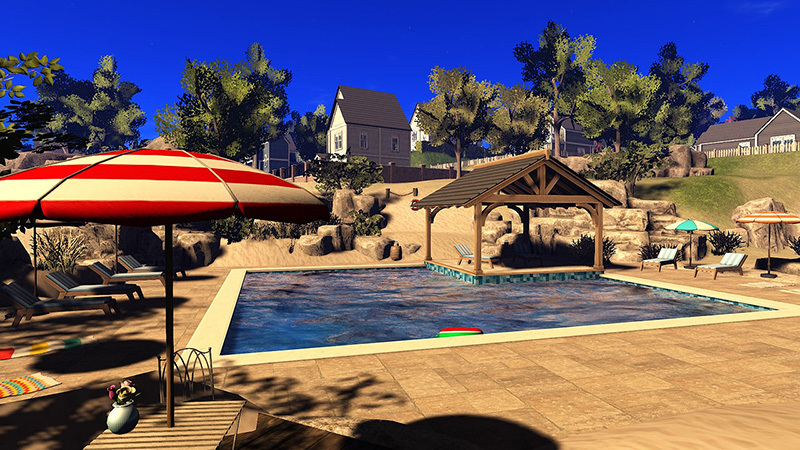 We would think in terms of key words or of the interest listings, as in the Second Life resident profiles. 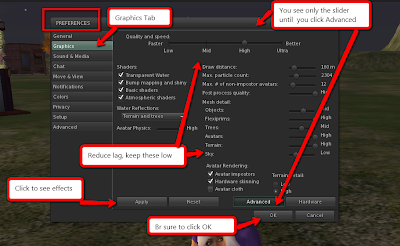 And that technology is readily available to Linden Lab, since they already have it operating in the profiles. I wonder if anybody at Linden Lab presently has the job of considering whether search in the Second Life Event Calendar could be improved. If I do find an event that I want to attend now or in the near future, the calendar gives me about the same service I would get from a slurl. I can click on the Where entry and get a landmark immediately if I have Second Live open. 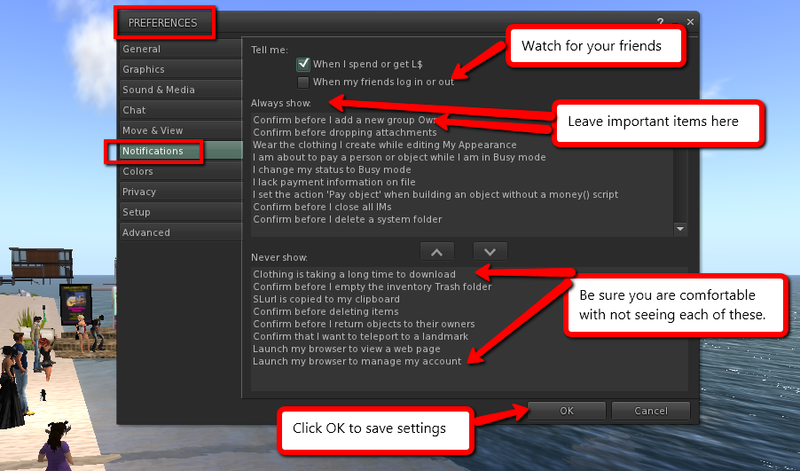 If I don't have Second Life open, I get the viewer loaded and an offer to open. If I take that offer, I get signed in, but find that Second Life does nor remember where I was going. 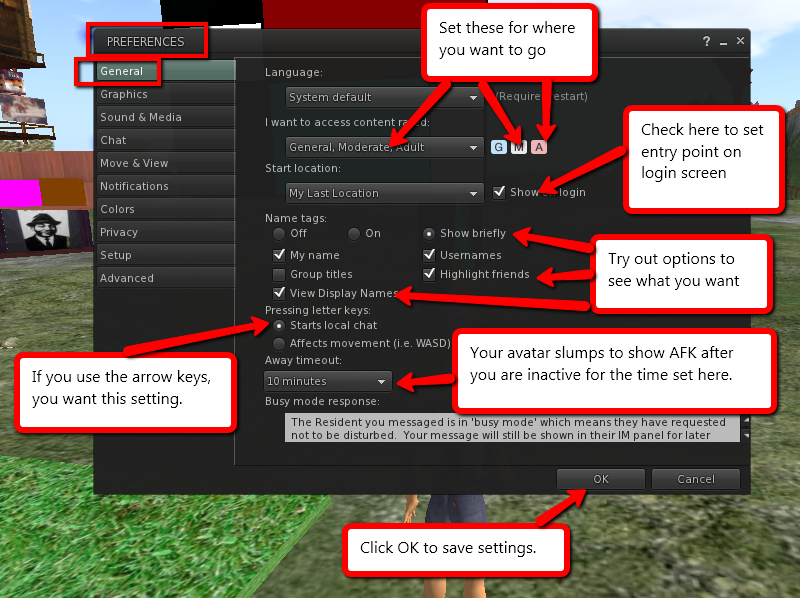 I have to click on the Where item again to get the landmark to my destination. So how well does this calendar do? As usual, the answer depends on the objective. Apparent objective: Help residents find out what is happening in Second Life right now or in the next few hours. On this objective, the Second Life Calendar does quite well, assuming most people are posting their events. Whether most people are posting their events or not, I can't tell, but the daily offerings I have seen do seem sparse. Prospective residents cannot see much about the offerings because they cannot log in. 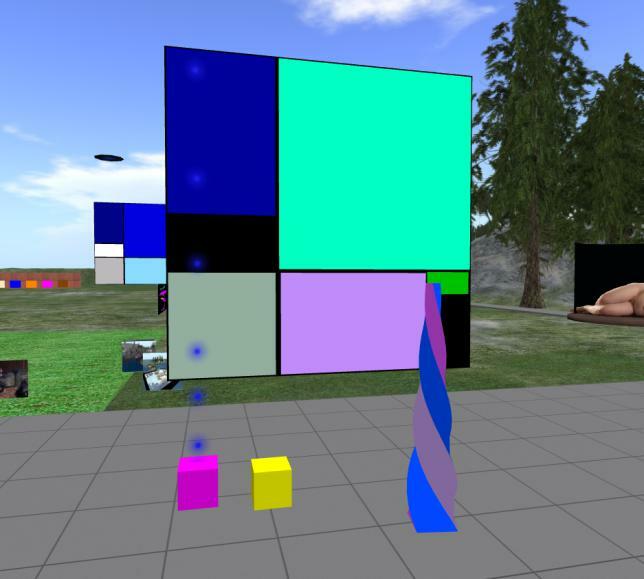 I can't tell non-residents to look at the calendar to see what is happening in Second Life. I can send them to the Destination Guide, though. That does a much better job of selling to prospective residents. 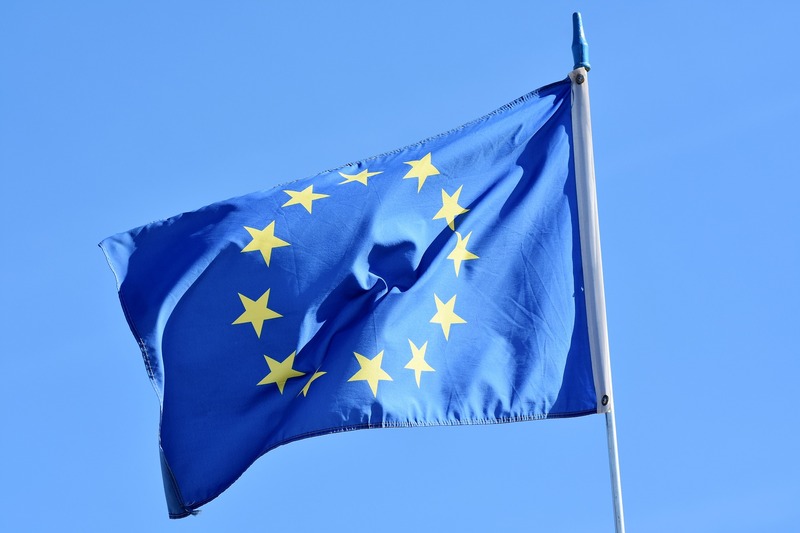 The category search methodology is way out of date and could be improved by application of the social matching technology used in the current profiles system. Performers and venues can use it now in their profiles. 2013 1stHELP: All my Lindens gone? Not really. Sometimes your viewer will show that you have no Lindens. Before you get upset, click on the amount shown. That will usually cause an update of the amount and correct the problem. One of the benefits of hanging out at a sandbox is that you get to see the work of expert builders. Here are some samples I saw as they were being built. 2013 HELP: Autoreturn: How do I use that? 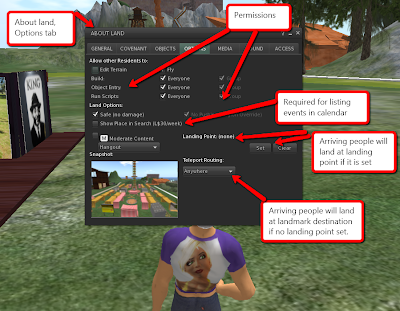 The function of Autoreturn is to keep your land clear of objects that you don't want while letting people rez objects for a short time. 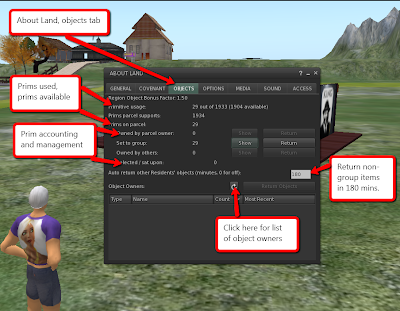 The other part is to keep autoreturn from returning objects that you want left on the land. If you own the land, objects you place will not be returned to you. To let other people place objects, you set or deed the land to a group, usually a group you own. You do not need to deed in order to give people build rights on the land. Setting the land to group will do fine. Caution: If you deed the land to a group (even your group) the group becomes the owner. Any objects that you placed as owner will be returned to you. Before you deed, set your objects to the group if you want them to stay. You can do that in the Build/edit window, General tab (below). The Group setting is near the middle. To change it, click on the crossed tools on the right. To let other people build on the land, you invite them into the group and give them rez rights in the group by assigning them a role that has that power. 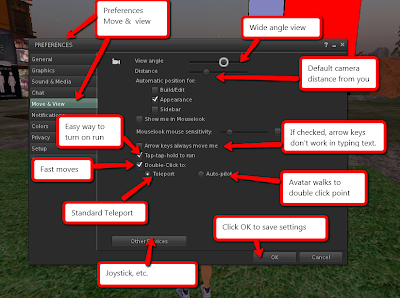 Caution: What governs autoreturn is the setting in the edit window. If the people you give authority to build are wearing the right group role, objects they place on the land will automatically get that setting. Hence they will escape autoreturn. Those people will sometimes forget to check their role when they build. 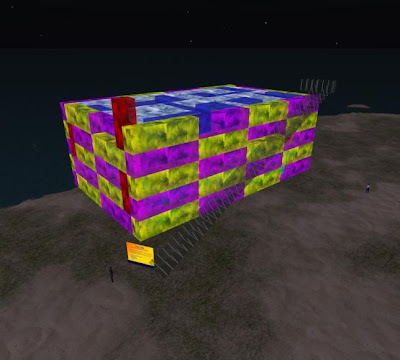 If they are not experienced in Second Life, they will then l ask you why their stuff got returned. Now you know what to tell them. "But I did not change my group." If you join a group, that group will become your active group. You won't notice the change till your stuff gets returned. 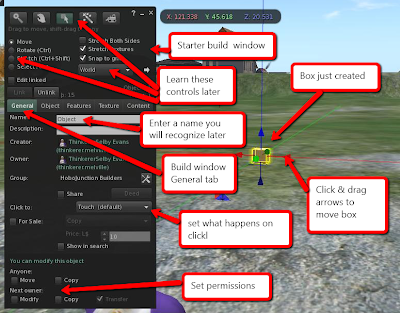 When you start to build you will have the edit window open. Make a habit of checking the group setting. Preferences: Notices. 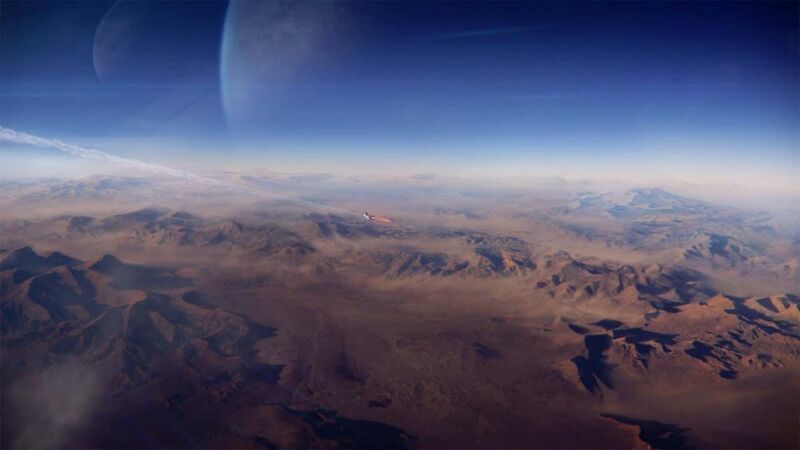 Suggested starter setting. If you have a lot of friends, you probably won't want to check this box. Leaving these notices on does not harm. You might want to leave them on until they annoy you. 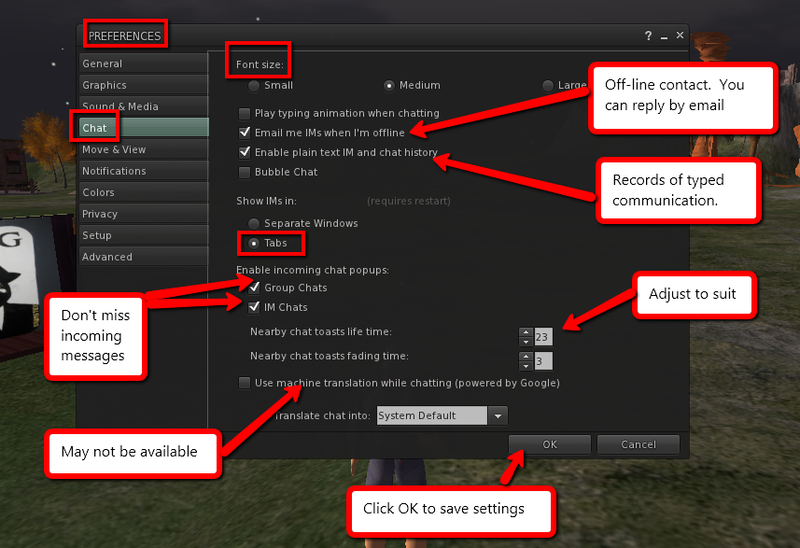 When you download and install a new viewer, you will sometimes have to go to this window and reset it the way you want. 2013 TKR: Start with what's right about you. 2013 1stHELP: My avatar doesn't look right.